This is by far our most popular Custom US Military Gift! 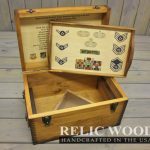 At Relic Wood we show our appreciation to our military branches by making top notch retirement gifts! There is no better way to show them how proud you truly are than giving them a handmade keepsake box that shows off all of their career achievements. Every one of our military retirement boxes comes standard with custom artwork of your choice, a shadowbox on the inside lid, a custom tray with a coin holder, a brass nameplate, a brass plaque and a flag holder. We also offer the service of pinning medals and badges. The shadowboxes come the appropriate color for the military branch. Each flag holder is encased with plexiglass to keep the flag in perfect condition. You may provide the artwork of your choice or we will be more than happy to design artwork for you. During each custom project we set up a project manager which allows us to properly communicate with our customers throughout the extent of the project. This provides an almost hands on experience for the customer. We can also provide pictures of the custom box during production to show its progress. 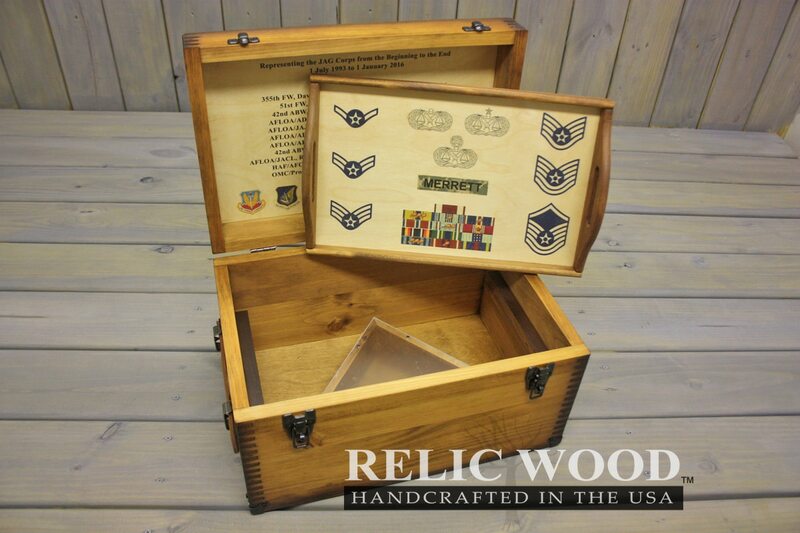 These Custom Military Retirement Keepsake Boxes are gifts that will last a lifetime. Each custom product is made right here in the USA by hardworking Americans just like you. We literally pour our own blood, sweat and tears into each product to make sure we give our customers exactly what they are looking for. We want these keepsake boxes to be something to brag about! PLEASE PLAN AHEAD! Custom Retirement Keepsakes usually SHIP IN 2-3 weeks from your approval of artwork proofs.